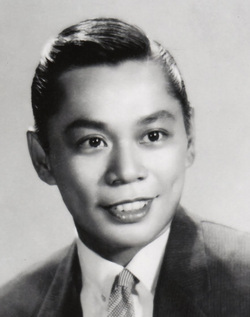 Augusto V. Pangan, Sr. (March 12, 1932 - July 3, 1997), better known as Chiquito, was a popular Filipino actor appearing mainly in comedy films. Chiquito was born Augusto Valdez Pangan in Manila. His entertainment career began at the age of 13, when he appeared in a major musical production at the Manila Grand Opera House. In the next several years, he was a fixture in the Manila bodabil circuit, popular for his skill in dancing the boogie-woogie. Chiquito also entered into local politics. He was elected three times as member of the local Council of Makati City (later Makati City), serving from 1969 to 1972, 1988 to 1992, and from 1995 until his death. He also served a brief stint as Vice-Mayor of Makati. In 1992, Chiquito sought election to the 9th Congress as a Senator. This one bid for national office ended in defeat. In July 3, 1997 was the day the laughter died. Chiquito, the master of broad comedy and character spoofs passed away at age 65 after a courageous bout with liver cancer at the Makati Medical Center. At present, his wife Vilma Pangan lives at their house in Daly City, California with son Augusto "Gus" Pangan, Jr. Chiquito has nine grandchildren. Each male born in generations bear their granddad’s name, Augusto, Augusto Pardo-----Marco Augusto, Ethan August, and Augusto Richo the first among all the grandsons. Augusto "Chiquito" Pangan is the second son of Manuel Pangan and Remedios Valdez. His siblings are Rene, Carmencita (Chita), Soledad (Soly), Manolito (Lito), half sibling Sylvia: half siblings Josefina (Finina), Agustin (Boy), Ernesto (Ernie), Teresa (Tes), Roberto (Bobet), and Dolores (Dolly).